Bring all offers on this 1996 48' Viking Sport Cruiser! : Atlantic Yacht & Ship, Inc.
Bring all offers on this 1996 48′ Viking Sport Cruiser! Word arrives from John Slate that the owner of the beautiful used 48′ Viking yacht for sale is looking for offers! Known as “Papa Bear,” this lovely used 48′ Viking yacht for sale is “turn key” and ready to go! In a word, this used 48′ Viking has two large staterooms, a great saloon, and a comfortable bridge. After all, her beautiful blue hull stand out in any marina. Furthermore, this hot blue hull gives her a sharp, clean look! As can be seen on the used 48′ Viking, her interior was updated in 2012 to look like new. Moreover the new interior styling is very tasteful. She has reliable Caterpillar diesel engines which make for a reliable performance at a low fuel burn. With a draft of only 3′, this yacht is a perfect Florida / Bahamas cruiser. She has been priced below market in order for a quick sale. This used 48′ Viking will offer her next owner days of priceless memories. And, as you will experience, you’ll get hours of fun local cruising opportunities. 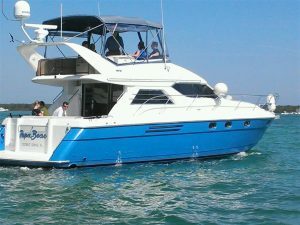 For more information on this sleek used 48′ Viking yacht for sale in Florida be sure to contact John Slate today! For over 56 years Atlantic Yacht & Ship has been serving the yachting community. Our headquarter sales office is dockside at Harbour Towne Marina. In the heart of the yachting capital of the world, Fort Lauderdale, FL. Our in-house waterside service department provides general yacht services. This includes from new teak, to engine rebuilds, captain services, and everything in between. Whether purchasing or marketing a quality vessel, Atlantic Yacht and Ship, Inc. is your one stop resource for the highest quality service and sales in the yachting industry today. If you are looking at yachts for sale, or thinking about selling your yacht, it is always wise to have an experienced broker representing your interests throughout the deal. Contact Atlantic Yacht & Ship at 954.921.1500 or click here. $10,000 price reduction on this beautiful 48′ Viking yacht! Best 58′ Viking available on the market!